It’s been half a year since I last mentioned Tesco Views and as it’s a new month and I couldn’t find any exciting bonus points offers I thought it would be good to write a reminder. Tesco Views is the offspring of Tesco Comments, a scheme which was trialed early in 2013 but then closed. You may have seen the little cards advertising it sitting by the checkout desks in your local store. You will either need a recent till receipt to hand or one of the little cards you find by the till (see below) as you will need to input the four digit store reference code. If you don’t have the receipt or a card, the code also appears on credit or debit card statements next to the store name. Answer a few quick questions about how long you had to queue, whether you could buy everything you wanted, and your overall experience and you’re done. 25 free Clubcard points will be added to your account. 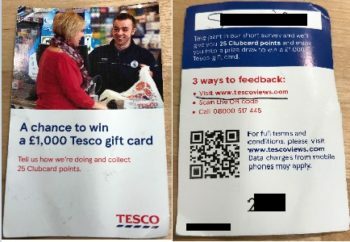 One lucky Tesco Views entrant each month will also win a £1,000 Tesco gift card (the T&Cs state that the last competition will be 1st September 2020). 25 extra Clubcard points are not super exciting, but if you remember to fill out the survey at the start of each month you will earn 300 free Clubcard points per year! 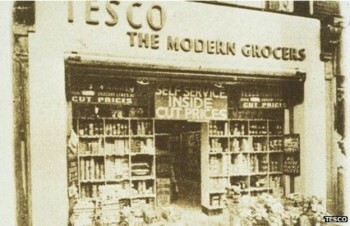 Why not give Tesco Views a try now? I wouldn’t bother – they only pay out 1 time in 5 or if you phone and complain! They are slower than they say, but I have received two lots of 25 Tesco Views oints this month, presumably for July and August surveys. with shopping only with no deals whatsoever. Compared to Sainsbury who keep sending me money off offers and Nectar offers, definitely pushing us towards them..not that I want Nectar points, but their marketing is way on top of Tesco. Yes, but Nectar points are still worth a fraction of Clubcard points, even after the recent deduction in value of Clubcard points. Good cheap marketing from Sainsbury’s though, because you think you’re getting loads in monetary value with all the Nectar points being thrown at you when really you’re getting diddly-squat. Incorrect. Sainsbury’s brought Argos 2 years prior to Tesco closing Direct.